Un elemento decorativo para la granja. Ultima Edición por Margotbean en 2018-08-15 15:40:26. The Lápida is a decorative piece of furniture that can be purchased from Pierre's stand at the Spirit's Eve festival for 350 or on Winter 15 from the Magic Shop Boat at the Night Market for 200 . 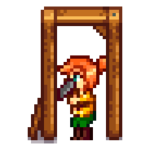 It may be placed anywhere in Stardew Valley, indoors or out. Esta página fue modificada por última vez el 15 ago 2018 a las 15:40.